Nicholas E. Roth: minister and bishop of the Salem Mennonite Church near Tofield, Alberta, was born 15 August 1870 near Flanagan in Livingston County, Illinois, and died at his home near Tofield, Alberta, on 14 January 1939. He married Amanda Bender on 28 January 1891. They were the parents of 3 sons and 4 daughters. The Roth family moved from Illinois to a farm near Milford, Nebraska, when Nicholas was 14 years old. There he was baptized and became a member of the East Fairview Mennonite Church in September of 1887. He served as the congregation's Sunday School Superintendent and was chosen by lot, and ordained to the office of deacon in 1896, as minister, without use of the lot, in 1902, to serve both the East and West Fairview churches, and as bishop, again without use of the lot, in 1906. In 1905 three men, J. L. Stauffer and his brothers-in-law, Nicholas and Valentine Roth travelled to Alberta to look for resettlement opportunities. They first examined the Calmar district, but then visited and bought land in the Round Hill area. 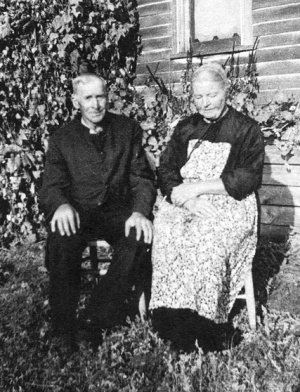 Five years later, several families comprising 29 people and including Nicholas Roth and his family, left Milford, Nebraska, to buy land or take up homesteads in the Round Hill/Tofield district of Alberta. A congregation was organized there later in 1910 under Roth's leadership. It was initially affiliated with the Western Amish Mennonite Conference but, owning to the remoteness of the Tofield congregation from the other congregations of that conference, an affiliation with the Alberta-Saskatchewan Mennonite Conference was arranged. Thereafter Nicholas Roth played a very active role in that conference, serving in numerous capacities, including that of President or Moderator. Like the other bishops of the conference, he traveled extensively, visiting the various congregations and scattered groups of Mennonite settlers in many districts of western Canada and the United States. In the Salem congregation he provided steady and effective leadership. His advice and counsel was respected. In his preaching he did not make use of notes, and his clear ringing voice had no need of an amplifier. Regehr, T. D. Faith, Life and Witness in the Northwest, 1903-2003: Centennial History of the Northwest Mennonite Conference. Kitchener, ON: Pandora Press, 2003. Stauffer, Ezra. History of the Alberta-Saskatchewan Mennonite Conference. Ryley, Alberta: Alberta-Saskatchewan Mennonite Conference, 1960: 82-83. Stauffer, Harry. "Historical Vignette." Newsletter of the Northwest Conference of the Mennonite Church (Spring 1995): 2. "Roth, Nicholas E." Gospel Herald (2 February 1939) . Round Hill & District. Salute The Pioneers - available at the Alberta-Glenbow Institute in Calgary. Regehr, Ted D. "Roth, Nicholas E. (1870-1939)." Global Anabaptist Mennonite Encyclopedia Online. December 2003. Web. 19 Apr 2019. http://gameo.org/index.php?title=Roth,_Nicholas_E._(1870-1939)&oldid=142229. Regehr, Ted D. (December 2003). Roth, Nicholas E. (1870-1939). Global Anabaptist Mennonite Encyclopedia Online. Retrieved 19 April 2019, from http://gameo.org/index.php?title=Roth,_Nicholas_E._(1870-1939)&oldid=142229. This page was last modified on 1 January 2017, at 21:56.